If you’re looking for a getaway where everything is taken care of, which vacation type — a cruise or an all-inclusive resort — is truly the better deal? The answer isn’t black and white, but we’ll break down what you get with each, so you can determine which is best for your next vacation. Cruising has two main advantages over resorts. The first is the obvious one — cruise ships move. That means on one weeklong vacation, you can visit multiple destinations without figuring out transportation logistics or packing your bags several times. It also means that ships can seek out the best weather. Cruise during hurricane season, and your ship will alter its route to get out of a storm’s way; book a resort stay, and you’ve got nowhere to go if a hurricane is bearing down on your island. The other is that modern-day cruise ships are packed to the gills with onboard activities. The newest ships sport rope courses, water parks, mini-golf, movie screens and rock climbing walls and crazy attractions like ziplines, bumper cars, surfing and skydiving simulators and other thrill rides. Daily schedules are filled with wine tastings, dance classes, educational programming, trivia games and other activities. Evenings bring Vegas-style shows, Broadway musicals, comedy, magic acts and a variety of live music and dancing. Cruise ships also have dedicated youth areas with kid-specific and family-friendly programming, for tots to teens, day and night. It takes work to be bored on a cruise ship. All-inclusive resorts, on the other hand, have rates that encompass much more. This means easier budgeting and no end-of-trip surprises. Head to a land-based all-inclusive, and your payment will include meals at all onsite restaurants, all drinks (soda, alcohol, coffee), beach and pool access, daytime activities like beach sports challenges, fitness classes, kids programming and nonmotorized water sports like snorkeling, kayaking and water bikes. Some may even include scuba and snorkel trips, beach and restaurant access at sister properties, and golf outings; others may provide resort credit to “pay” for activities like zipline outings and ruins tours, or offer one free excursion per passenger. The main benefit of this style of vacation is that it’s incredibly relaxing. You can spend the entire day in the pool if you’d like — sometimes even ordering food and drink without leaving the water. You can take out a kayak or go snorkeling if you like, but it’s a lazy venture from the property, not an all-day excursion. And if you love the beach, you can head into the waves whenever you want, rather than waiting for a ship to dock. Resorts also have more space than compact cruise ships. Standard hotel rooms will be larger than cruise cabins, and some resorts might have options for overwater bungalows or casitas for more space and more privacy. On the flip side, you might find that you’re doing more walking to get from your room to the beach to the restaurant if you’re at a large resort. Evening activities tend to center around drinking and dancing, rather than shows, which can be a plus or minus depending on your taste. Kids’ programming and facilities are not always as organized as on cruise ships. And, of course, you’re limited to the resort area. That means you’ll likely only experience one area of one island — or possibly never leave the resort grounds except to have dinner at a sister resort. If the weather gets bad, you’re stuck. Cruise vs. All-Inclusive Resort: Which Is Cheaper? It’s hard to compare apples to apples to find out whether a cruise or all-inclusive resort is cheaper. Mimi Comfort, owner of Cruise Holidays in Kansas City (a Travel Leaders Network member), priced out a couple of vacation options, so we could compare. A weeklong Royal Caribbean cruise started at $1,242 for two people in an inside cabin, while a similar stay at the four-star Paradisus Playa del Carmen La Esmeralda cost $2,551. That’s roughly double for the all-inclusive. If you start adding beverage packages, specialty dining and shore excursions into the mix, however, the cost of the cruise can quickly skyrocket. On the upscale end, Comfort priced an eight-night Caribbean cruise on Azamara Club Cruises (which includes select drinks and tips) from $4,500 for two people in an inside cabin and a stay at the El Dorado Casitas Royale at $5,566. Again, the cruise is cheaper, but the resort was offering a $1,000 resort credit (which can be used for things like fancy wine or a scuba tour), which makes the price more attractive. 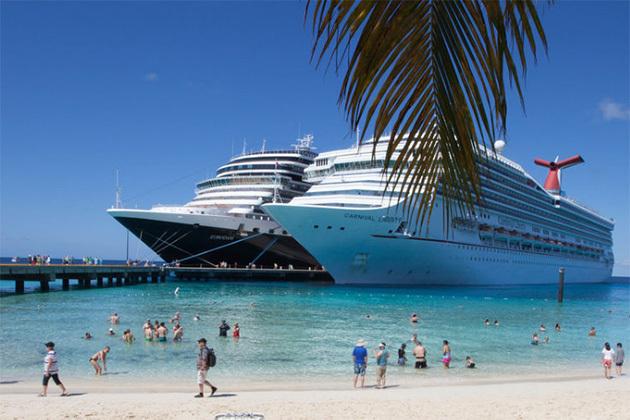 Generally, the base cruise fare will likely be cheaper when comparing comparable vacations; the amount of extra purchases you make for tours, drinks, spa treatments and other extras will really determine whether a cruise or resort is the better deal for you. When you do these calculations, don’t forget to include airfare. Most all-inclusive resorts are located outside the United States, making flying a necessity. Cruises, on the other hand, depart from a large selection of U.S. cities, so it’s easy for a significant portion of U.S. travelers to drive there or book a cheap flight. No one books a vacation solely on price. Determining which option is the best value depends on your priorities and spending habits. With both cruises and resort stays, you can also find ways to save. For example, if you never spend any time in your cabin on a cruise, you can save on a cheaper outside cabin instead of shelling out for a balcony cabin or suite you won’t truly appreciate. Similarly, if you just need the beach and not a lot of activity or dining choice, then you probably don’t need to splurge on a more expensive resort with all sorts of amenities. You want to visit multiple destinations in a week and have plenty of activities to choose from when onboard. You don’t spend a lot on extras like shore excursions, spa treatments or specialty dining. The base prices for cruises are typically lower than prices for resorts because the cruise lines expect you to make up the difference in onboard purchases. You don’t drink. At an all-inclusive, you will be subsidizing someone else’s alcohol consumption. You like Broadway-style entertainment at night. Resort entertainment, when there is some, tends to be more low-key, showcasing local acts, or centered around discos and night clubs. You like to gamble. Few all-inclusive resorts have onsite casinos. You have trouble with mobility, and like the self-contained nature of a cruise ship versus a resort, which can be spread out across a huge property. You’re looking for a truly relaxing vacation, with very little on the schedule. You like hanging out in a bathing suit all day. Most cruise lines make you put on a cover-up to grab a buffet meal. You want to be able to walk on the beach at sunrise or sunset … or any time you want. With a cruise, you’re restricted to hours in port; at a resort, the beach is right out your front door. You want to eat and drink as much as possible without worrying about racking up high bills for cocktails or trying out multiple dining options. You plan on taking advantage of water sports and other activities. If you want to spend your vacation snorkeling, kayaking and body surfing, you’ll save money at the resort where these activities are included versus a cruise, which charges for these activities in port. You’re an avid golfer or scuba diver. You can book resorts that are dedicated to these activities, with included or onsite offerings. On a cruise, you will only be able to book these tours on port days. If you’re still confused about which option is the best value for you — both in terms of price and vacation satisfaction — reach out to a travel agent. Most agents who sell cruises also sell all-inclusive resort vacations. Getting advice from an expert who’s knowledgeable about different resorts and ships, as well as picking the trip that best meets your budget and holiday preferences, might be the easiest way to get the best value for your vacation dollar.